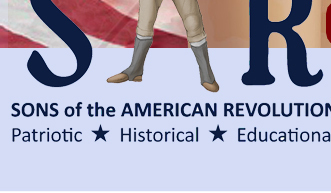 "The National Society of the Sons of the American Revolution (SAR) invites all high school students (9th through 12th grades) interested in the American Revolution to participate in the George S. & Stella M. Knight Essay Contest. The contest is open to all students attending home schools, public, parochial, or private high schools in that same grade range. The National Association of Secondary School Principals has placed this program on the 2017-18 NASSP List of Approved Contests, Programs, and Activities for Students." "To participate, students must submit an original 800 to 1,200 word essay based on an event, person, philosophy or ideal associated with the American Revolution, Declaration of Independence, or the framing of the United States Constitution. Each student's essay will be judged based upon its historical accuracy, clarity, organization, grammar and spelling, and documentation." "The contest is conducted in three phases: the local chapter, state-level society, and national phases. The contest must be entered through an SAR chapter near the student's residence. Only one entry per student is permitted per contest year." Contest entries must be submitted as PDF files attached to an email to the Contest Chairman. The title page, bibliography, and applicant's biography must be listed on separate pages and no reference to the applicant's name or information can be part of the essay pages or bibliography. Plagiarism will be grounds for immediate disqualification. An original copy of the essay must be submitted. Poor quality copies will not be accepted. When counting words in a date, a numerical date (1776) or a date spelled out (Seventeen seventy-six) shall be counted as one word. The essay must have a minimum of 800 words and not exceed 1,200 words (excluding title page, footnotes, bibliography page, and biography page). No bindings or special covers are needed. Citations in the essay and references in the bibliography must be documented in accordance with a widely used and publicly available citation system. Examples of a citation system include the Chicago Manual of Style, the MLA Manual of Style, the MHRA Style Guide, The Bluebook: A Uniform System of Citation, and "Harvard referencing." The bibliography page must specify the system used. Students must source at least five references with the minimum of three being published works to allow for verification of sources if necessary. References from encyclopedias or the Internet will be accepted, but are not considered as part of the three published book sources. If there are no published references, the essay will be disqualified. Please follow these rules exactly as essays that don't conform may be immediately disqualified. * The Piedmont Chapter winner qualifies for the State SAR competition. * A contestant from Piedmont that finishes first in the State SAR competition will receive an additional $100. All other applicants receive an SAR Certificate of Participation. Judging is on individual applicants, not per school. Entry deadline to the Piedmont Knight Essay contest is December 1st. The Georgia SAR winner qualifies for the National SAR Knight Essay competition. * State 1st place cash award changed at 7/28 State BOM meeting per G. Thurmond. National winner receives a medal and recognition certificate; up to $500 toward travel expenses and one-night hotel stay for the winner and chaperone at the annual SAR Congress held in July. The winning essay of the national contest will be submitted for publication in the SAR Magazine. Participants in this contest agree that their essay may be published in the SAR Magazine and on the SAR Knight Essay Contest webpage. Winning essay participants, on all levels, may be required to supply a tax identification number in order to receive their award. By entering this contest, all participants agree that if their essay is chosen as the national winning essay, it will be the property of the National Society of the Sons of the American Revolution (SAR). All participants further agree that the national winning essay may not be submitted to any other contest or used for any other purpose without the express permission of the national SAR Knight Essay Contest Chairman. Applicants in the Knight Essay Contest agree that the interpretation of the rules and decisions of the National Chairman and its judges must govern without reservation and that decisions of the judges and/or the National Chairman are final and not subject to review. Entries to the Knight Essay Contest must be submitted by December 1st. Questions can be answered by the Piedmont Chapter & State SAR Contest Chairman.